In our ever increasing support of our troops we have created this page to show our appreciation to those who put their lives on the line to ensure our liberties. From the GI of World War II to those coming home from Operation Iraqi freedom, AirSplat is proud to support all veterans. Airsoft is a sport largely based on military simulation. Players play the roles of the GI that keep our country free. We strongly believe in supporting our troops and GI for their services. Plus, airsoft would not be the same without them. As the nation's largest airsoft retailer, we have the means to reach out to organizations that aid our GI veterans. We honor and repay them by holding special airsoft events and providing special offers that benefit the GI aiding organizations that help our GI veterans get back on their feet. We offer sponsorships of organizations who work hard to provide necessities and comforts to the GI that need it the most. From Guns, Guts to Glory, our veterans and active duty GI military personnel risk all they have, and all they are to ensure that the freedom of America and the world will live on. AirSplat, the airsoft community, and the citizens of this nation owe a great debt of gratitude for the sacrifices and services of all members of our armed forces. AirSplat donated some AirSplat sweaters, shirts, backpacks, and swag to an Army base in Fort Still, OK! These backbacks were requested by Staff Sergeant Parrish for training purposes due to budget cuts. Airsplat is always looking for ways to give back to the community and what better way to do this than by helping our troops! AirSplat, the airsoft community, and the citizens of this nation owe a great debt of gratitude for the sacrifices and services of all members of our armed forces. Thank you! For more information, visit AirSplat's Official Blog! On April 25, 2012, we helped sponsor the California State Military Reserve's Recruiting Task Force-South's recruiting outreach at the California Police Expo. They recruit at events such as the Police Expo, Chino Air Show, Car Shows, and other events in Southern California. We contributed the A&K M249 MKII Airsoft SAW Machine Gun for their staging and public involvment. AirSplat is always happy to support our military in any which way possible. The officers and enlisted cadre of Recruiting Task Force South wish to sincerely thank you and AirSplat for your kind assistance is helping our unit secure the AirSplat M249 SAW for our recruiting outreach. AirSplat is well-known for its support of our military, both through its training products, and contributions. AirSplat’s Founder started with a humble beginning. He had a good idea, and was able to run with it. He and his company obviously respect the opportunities that have been afforded him, and you put forth the extra effort to give back a little when a situation arises. We are grateful for your support. We will put the M249 SAW to good use. We completed our modifications and began displaying the weapon at our recruiting event this past weekend at the Southern California Police Expo at the Pasadena Rose Bowl. Attached are some photographs for you to see the fruits of your kindness. airsoft with the Red Bluff youth group, a great mentorship experience for the kids and team building experience for the troops and cadets. AirSplat provided tons of supplies with various airsoft AEG's, BB's for everyone to use, sweaters, and prizes for giveaways for the event! On 9/11/2010 AirSplat shows our patriotism and appreciation to airsoft players, and veteran and active GI both stateside and overseas. Tis will be a large scale airsoft game. Entry is $15.00. 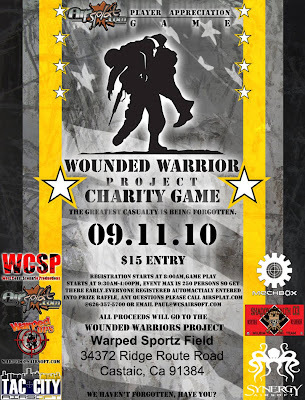 All proceeds from this event will be donated to the Wounded Warrior Project to raise awareness and enlist the public’s aid for the needs of severely injured service men and women. To help severely injured service members aid and assist each other, and to provide unique, direct programs and services to meet the needs of severely injured service members. All players will receive free stuff including a Marpat Airsoft Duffel Bag, Water Bottle, AirSplat Tactical Vest Sweater, AirSplat T-Shirt, a bag of AirSoft BBs and Patches! This is over $70 worth of gear and merchandise! The BBs alone will cover your entry fee. Free lunch is also offered! Don't miss out on this massive airsoft game event. Space is limited, so come and register early! Play airsoft and support Veteran GI what more can you ask for? Here are the giveaway packages ready to be given out!